Coming off my worst race by the numbers but a huge personal accomplishment I was asked to give advice to a new triathlete. First of all, I’d encourage any new triathletes to NOT read my previous post as I would hate for my anxiety issues to spread like wildfire. But I do have some advice I’d like to share with anyone bored with one sport and crazy enough to dive into the punishment/addiction/challenge that is Triathlon. So Casey – this post is for you! Respect the Sport! Triathletes are competitive and you don’t want to get in someones way, slow down their transition or look like an idiot on the course. Most triathletes I meet have a history in one aspect of the sport, but dove into the other two elements had first (usually swimmers who take on running and cycling or cyclists who take on swimming and running). You’ll need to learn the lingo like T1, T2, Open Water and Drafting. And you’ll have to understand new phrases like Rolling Starts, Age groups, Passing Rules and Race Etiquette. Luckily most races have athlete guides. And always try to speak with a triathlete experienced with your race to get expert advice on the course – as they vary and conditions can change. Know what the water conditions are in advance. Be prepared if you need a wetsuit or if the temperature bans wetsuits on the course. 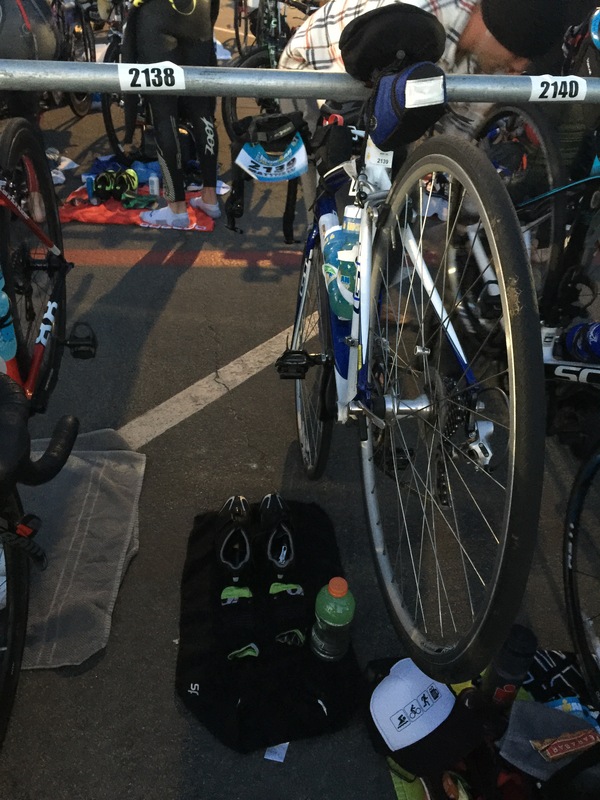 For example, Oceanside 70.3 is beautiful and sunny weather for the bike and run – but the transition area opens at 4:30am and the temperature is in the low 50’s so you better have warm sweatpants and a jacket on hand to stay warm before the race start! Train Insane or Remain The Same! You will know the distance that you will be racing, so push yourself to be able to tackle that distance with confidence and a little more. Race day will have a bunch of unexpected challenges, don’t let fatigue and physical ability be road blocks to your success. When I first started with sprint triathlons, I would train for 6-10 miles when my race was only a 5K (3.1 miles) knowing that the run would be the last obstacle in the race and I wanted to have plenty of fuel to keep going out of T2! Also don’t underestimate your transitions – and the only way to get this right is to practice! Brick workouts are workouts that transition between Swim and Bikes or Bikes and Runs! Get plenty of practice transitioning so you get quick at making the changes AND your muscles adapt to the quick change in physical demands! Understand your body and the fuel it needs! Few sports involve hours of demanding physical activity – which means your body needs to have the correct fuel to help you get the max output needed for race day and training! Make sure you understand what your body needs and listen when your body gives you signs. Proper hydration and fueling can make or break a practice and can derail your race before it starts. Keep It Simple! Minimize your gear to just what you need and never tryout new gear on race day! There are a few key items that you NEED and a few hundred other items you may think you need – but you don’t. Practicing your transitions will help you trim down your race needs that will help keep your transiton area simple – AND keep your transition items in YOUR space – which may only be a few inches from your neighbors. But also be prepared – while “less is more” is good etiquette, you also need to be prepared. In my tri-bag (yes, you too should have a bag dedicated to triathlons) I have a zip log bag filled with first aid supplies. You never know when you’ll need blister repair, road rash clean up or extra sun screen/contacts/etc… You can’t rely on the course or course assistance to have you covered. And since a Port-a-Potty is a staple of most races, make sure you have Clorox Wipes and flushable wipes as your gonna need them! 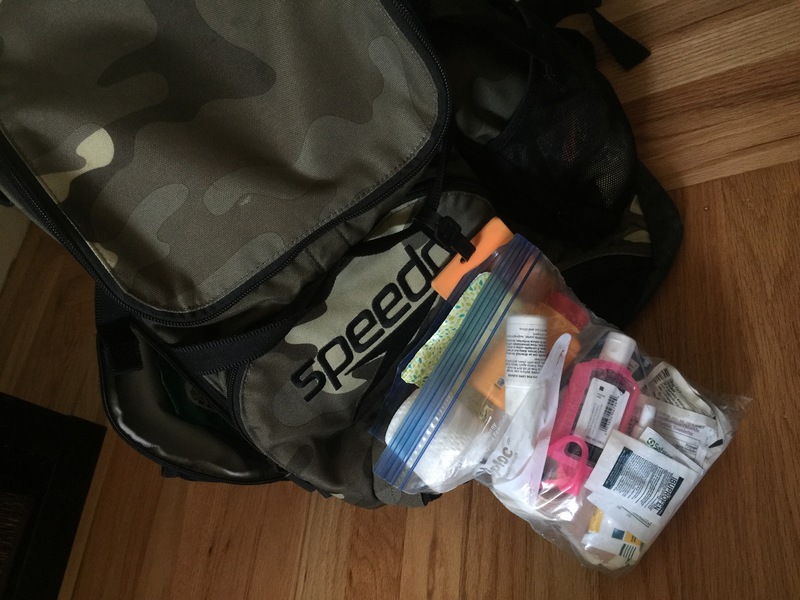 And speaking of the tri-bag of extra supplies, that leads me to the next item on the must have list – a Race Crew! You’ll need a bag that will House all of your tri-needs! Mine is 3 years old and isn’t going anywhere anytime soon! And a triathletes first aid kit is 50% Nurse 50% Athletic Trainer! Most races will give you a specific place to rack your bike. Your transition supplies shouldn’t exceed the width of your handlebars and you should be able to visibly see what stuff is yours and what is your neighbors! Support Crew! You need a wingman/woman who will be patient enough to wait for hours for you to finish the race, understand the sport to give you pace reminders as you pass them on the course and can sport your tri-bag with your race extras while you’re on the course! For me, just having the mental support makes a world of difference on race day! Whether its the person who is taking pictures of you, throwing you extra nutrition mid race or being there to remind you that “you can do it” you need to have a support crew/person on race day! Have a Routine! I layout all of my transition items the night before and make sure that I know what I need and know where it is for when I need it. And the morning of the race I shower and apply a layer of lotion sunscreen, body glide (your new best friend) and then a spray layer of sunscreen… Did I mention sunscreen? Then I get dressed so I am comfortable in my race kit and know I’ve applied enough body glide to get me through the day! Friction is not your friend! Posted in adventuring, fitness, triathlonTagged bike, ironman, ironman training, multisport, run, swim, triathlonBookmark the permalink.